The Glessner House today, photo courtesy of the Glessner House Museum. The piece is a ceramic bowl and lid decorated with flowers, vines, and other patterns. It has been in the Glessner family collection since at least 1923, when the photo below was taken. Since then, the collection was given to various family members. The house, an Italian Palazzo-style building which is now a Chicago landmark, was almost demolished in 1966. After saving the house from destruction, Martha Batchelder, a descendant of the Glessner family, began to return many of the original furnishings, including the piece recently treated. The bowl on the top shelf at the left in 1923, photo courtesy of the Glessner House Museum. The piece accidentally fell from its display and the bowl broke into several pieces. 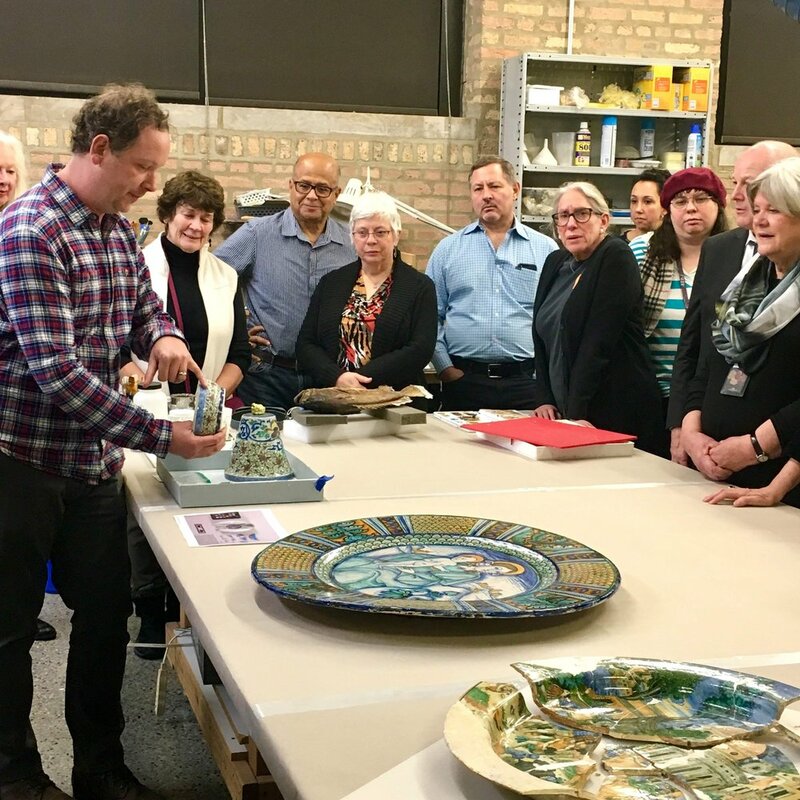 Luckily, William Tyre, Executive Director and Curator at Glessner House, was prudent and retained all of the pieces, no matter how miniscule. It was brought to The Center and upon initial examination, Sian Pirnie, Associate Conservator of Objects, reported that the glaze on the lid was flaking in areas located at the top in the large flower decorations and the area around the ornamental dog piece. She also noticed that the dog ornamentation on the top of the lid appeared to have been broken off into around 4-5 pieces, then poorly repaired. More specifically, the adhesive used in the repair was brown and brittle from age. There were also missing segments around the nose and eye area of the dog. The bowl needed the most work, as it had broken into 15 large fragments and a bag full of small fragments and needed to be pieced back together. The damage to the piece also included glazing and porcelain losses around the break edges. Like the lid, there were areas of glazing on the inside bottom of the bowl that were flaking. 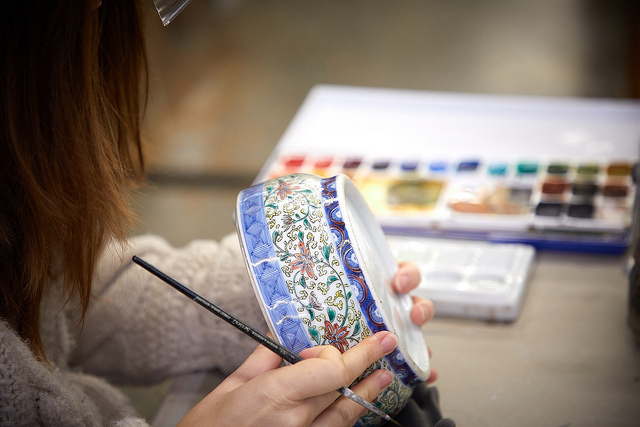 Sian inpaints the bowl with reversible paints. The first step of the treatment was to put the bowl back together. This was accomplished with a lot of patience, skill, and conservation-grade adhesives. “It was like a 3D jigsaw puzzle,” Sian told us. She included all but few of the retained fragments in the reconstruction, since not all could be used. After the bowl was back together, Sian filled and painted the break-lines to integrate the surrounding areas as best as possible. However, some areas of inpainting remain visible post-treatment. Inpainting small details requires intense focus and precision. Additionally, Sian removed the dog ornament and its old adhesive holding the fragments together, then replaced it with conservation-grade adhesive. Part of the dog’s nose was broken off, so she modeled the missing piece out of two-part epoxy putty, which “becomes as hard as porcelain.” She also consolidated the flaking glazing throughout both the lid and the bowl, and finally inpainted any areas of loss with watercolors and finished with a layer of restoration glaze.